Designing and building any interplanetary spacecraft is a complex, difficult task. Designing and building NASA’s Parker Solar Probe—the first spacecraft destined to perform groundbreaking science in the harsh environment of the sun’s corona—is even more challenging due to the hazards the mission will face. 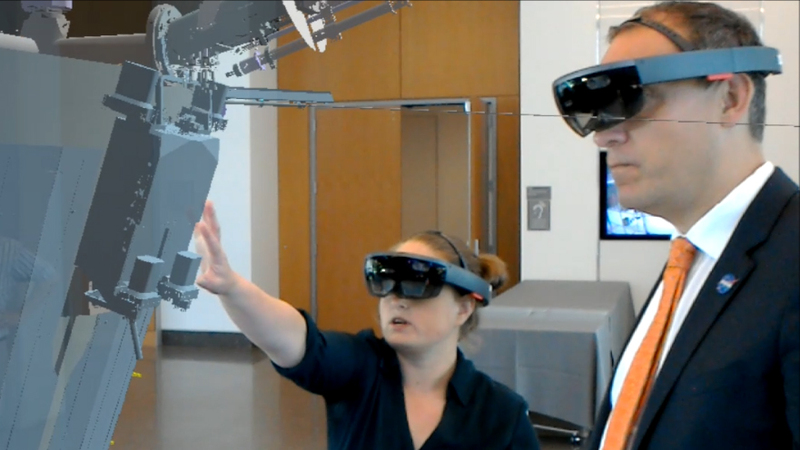 That’s why engineers from the Johns Hopkins Applied Physics Laboratory in Laurel, Maryland (where Parker Solar Probe is under construction) are leveraging a new augmented reality (AR) tool called ProtoSpace, developed at NASA’s Jet Propulsion Laboratory, to improve how the men and women building the spacecraft can work on construction in a virtual, digital space. In early 2017, APL’s Devin Hahne, mechanical design engineer for the spacecraft’s high and low gain antennas, and other Lab researchers had proposed an augmented reality system as part of an independent research and development grant; they traveled to JPL in Pasadena, California to see ProtoSpace, a more developed version that uses Microsoft’s HoloLens AR headsets. “We went to JPL and demonstrated our projects for each other,” said Hahne, “and there was a great collaborative aspect to the visit. We knew we wanted to use ProtoSpace on Parker Solar Probe.” Soon afterward, an agreement to use the technology on the mission was reached. In March, JPL’s ProtoSpace team visited APL’s Laurel, Maryland campus, and performed a demo with the Parker Solar Probe team—the first ever done outside of JPL. That’s when Felipe Ruiz, Deputy Lead Mechanical Engineer for Parker Solar Probe, became involved. During the JPL team’s visit, a demonstration of ProtoSpace with Parker Solar Probe was set up for the thermal blanket team (the blankets protect the spacecraft from extreme temperatures, and are placed in different thicknesses in different locations around the probe). “We had six people in a conference room wearing HoloLenses and looking at the CAD design of Parker Solar Probe,” Ruiz said. To examine one part of the bottom of the spacecraft, Ruiz “lifted” the digital model of the probe, and to get a better look, everyone laid on the floor of the meeting space. “I looked in with APL’s Tim Cole [PSP Lead Mechanical Engineer] and there were a half-dozen people lying on the ground, wearing headsets and pointing up in the air and talking,” said Hahne. Watch video of Devin Hahne using ProtoSpace to demonstrate how installation processes for Parker Solar Probe's high gain antenna were explored. Through a series of clever software manipulations, the ProtoSpace team created a way to employ the incredibly complex CAD models by “turning off” portions of the design that can’t be seen. By cutting back drastically on the amount of information the HoloLens had to display, speed and utility were greatly increased. The system can support up to 10 users collaborating at one time; even larger teams are possible by using a scripted performance, akin to a PowerPoint presentation. “Those larger deployments can be used for proposals and review boards, and are extremely effective,” Vona said. ProtoSpace is relatively easy to set up and operate; Hahne brought several headsets from APL to the University of Chicago for the Parker Solar Probe renaming event in May, and guests could “tour” the spacecraft and ask NASA and APL staff members about the construction. At that AR rehearsal and walk-through, it was discovered that the location of a bracket would have obstructed access to a bolt that needed to be installed. “We found that the procedure needed a couple of edits, and it’s much easier to find that out three days before the installation instead of the day it happens,” said Ruiz. Take an augmented reality tour with Johns Hopkins APL's Devin Hahne, mechanical design engineer for Parker Solar Probe's high and low gain antennas, as he uses the ProtoSpace tool developed by NASA Jet Propulsion Laboratory to demonstrate how installation processes for the spacecraft's high gain antenna were developed. Johns Hopkins APL's Betsy Congdon (left) and NASA's Thomas Zurbuchen, head of the agency's Science Mission Directorate, at the Parker Solar Probe renaming event at the University of Chicago in May. The augmented reality spacecraft model is visible at left. 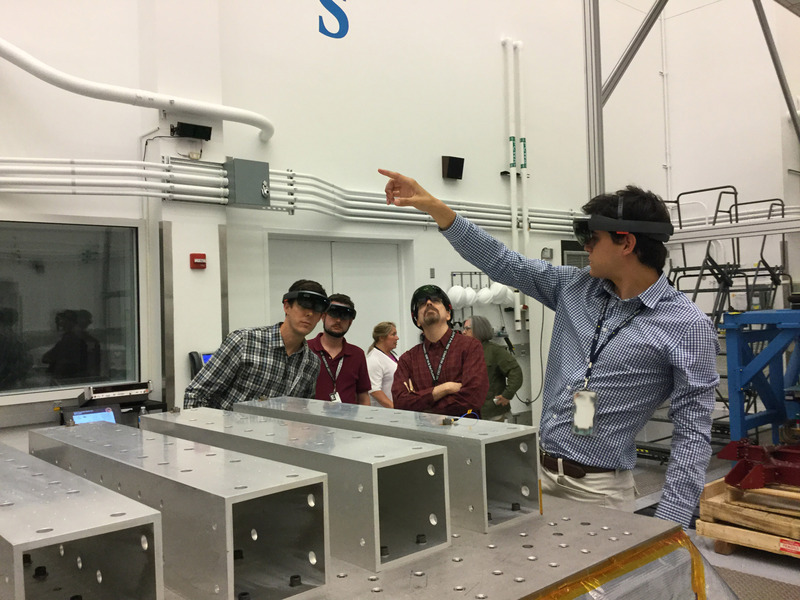 Felipe Ruiz, of Johns Hopkins APL, points to a section of the Parker Solar Probe spacecraft visible only to the group wearing HoloLens augmented reality glasses.